There are two forms of asphalt shingles – organic and fiberglass. Fiberglass asphalt shingles are also referred to as glass fiber. Organic asphalt shingles are constructed with a paper backing that has a layer of asphalt on top. In a fiberglass asphalt shingle, the backing is fiberglass with a layer of asphalt on top of the fiberglass. Composition shingles use a fiberglass reinforcing mat that is coated with mineral fillers and then with asphalt. The top surface of the shingles is then embedded with ceramic granules. An option with asphalt shingles is to treat them for resistance to algae growth. This is done by using granules containing leachable copper. 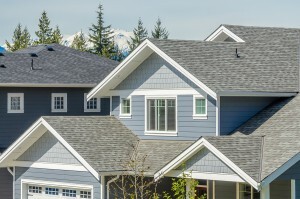 Composition shingles are made with moss and algae inhibitors. Composition shingles can also have a special coating that will protect against ultraviolet light. Rays of ultraviolet light from the sun can cause shingles to crack and fade. Composition shingles are available in a wide variety of colors and sizes, including faux finishes such as shake and slate. Composition shingles have a much longer life. Organic asphalt shingles are considered to be less harmful to the environment. Fiberglass asphalt shingles aren’t as environmentally friendly, but they have gained popularity due to increased durability. Composition shingles are environmentally-friendly in that recycled materials are used in their manufacture. The warranty on asphalt shingles can range from five to 20 years, with the time difference based on the strength rating of the shingles. Composition shingles are usually warranted for 30 to 50 years. Organic asphalt shingles are less expensive than other types of roofing. Asphalt shingles are cheaper to buy than composition shingles. However, when the cost of composition shingles is based upon the life expectancy of the shingles and the much longer warranty period, composition shingles are more cost-effective.